I would like to take this opportunity to wish everyone a Happy New Year and all the best for 2008. It was the 30th Anniversary of Star Wars, the iPhone was introduced, Jade Goody became a racist, the Global War on Terror raged on, Scorsese finally got his Oscar, The worst shooting rampage in US history took place at Virginia Tech., The Sopranos ended, Madeline McCann disappeared, Tony Blair stepped down, Millions of Chinese toys are recalled, Owen Wilson gets depressed, Al Gore won the Nobel Peace Prize, Britney Spears shaved her head but her comeback bombed, Iran continued it’s nuclear defiance, The WGA went ton strike, Hugo Chavez will not be president for life and Benazir Bhutto was assassinated. 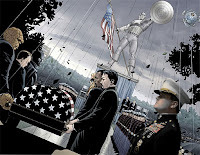 In 2007 we also lost Luciano Pavarotti (71), Anna Nicole Smith (39), Boris Yeltsin (76) Paul Tibbets (92), Joe Dolan (68), Evel Knievel (69), Robert Goulet (73), Lois Maxwell (80), Robert Jordan (58), Jane Wyman (90) and Steve Rodgers (90). My predictions for 2008 are: That Time Travel becomes a reality, Extra-Terrestrials will make contact and Duke Nukem Forever will be released. (Well OK, maybe that last one was a bit far-fetched). Lt.Col - I hope you disinfected your hand after that picture was taken. Ah well Happy New Year everybody! @ Vaughan: He will always be remembered here Vaughan even when forgotten by people who take their freedom for granted. 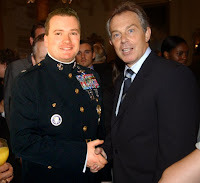 Lt.Col, Funny that, Mr. Blair was famed for wiping Bush's with his. Don't forget in looking ahead to the months to come the following event: The Russell Invasion of France! @ Civvy: I'm glad to see the New Year binge didn't dull your wit. @ Bruce: I will give you some reserve forces to command if you so wish Colonel Russel? Don't worry, I'm sure the Bruce Russell invasion will be met at Charles DeGaulle airport by a government official surrenduring - just to be safe. The first time I visited France, I nearly came to blows with a Froggie customs official who had the audacity to refuse me a passport stamp. Granted, since I'd entered the EU through Ireland, where I'd spent the several weeks preceding, I didn't per se NEED a stamp, but by God I wanted one for a souvenir and Katie bar the door if I didn't get one. Of course, I didn't end up with the stamp, but that, as they say, is a tale for another time . . .
@ Lt. Colonel: You may expect troop and provision requests shortly. With your help, we can keep supply lines short and French casualties high! Heeya! Bruce Russell! Don't sully their fine land by teaching them our redneck slang! Next thing you know there will be freckled faced little Irish boys and girls inviting each other to tell it to the hand because the face is not listening! Duke Nukem Forever ® NEWS!!!! Darth Maul is Snake Eyes!